Are you on a countdown for Halloween? I certainly am, but it’s not entirely for the reason that you’re thinking. Yes, I can’t wait to see my girls dressed up and hear Riley’s little “Trick or Treat.” I am super excited for the day after though. All that leftover candy! Last week I shared my Milky Way Cupcakes and if you thought those sounded good just wait. 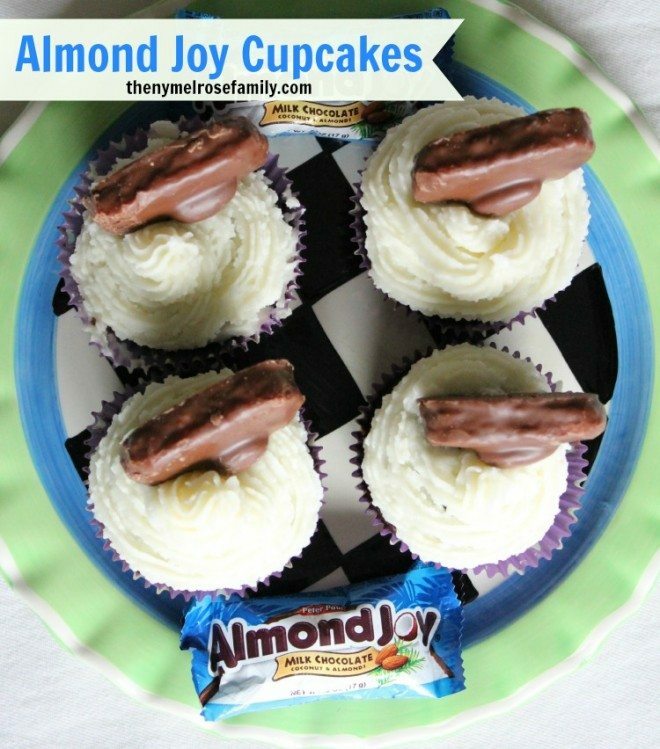 These Almond Joy Cupcakes are going to knock your socks right off! Jenny, I don’t blame that teacher one bit–I would totally devour these by the dozen 🙂 They look absolutely amazing! Be sure to use POWDERED coffee mate! I used liquid and messed up a batch of frosting. I’m assuming it would have come out correct if I’d used powdered coffee mate. Tonya, I’ve duplicated this recipe multiple times and I’ve used liquid creamer every time. What happened to the frosting? I’m so sorry it didn’t work for you. My icing came out runny. Do you think it could be because I used margerine instead of real butter?